Already the first sailors and conquerors of the Polynesian Islands report to have seen local inhabitants riding the waves of the Indian Ocean. It seems that in these times “surfing” had mainly been a sport of honour and strength among the kings of different islands. Centuries later “the sport of kings” went out in the world to become a lifestyle sport of the youth and the eternal young. It cannot be overlooked that since several decades the sport of surfing has reached an ever-wider audience and that surfing has become an attractive sport for the youth. National and international surfing events have gained more and more public attention. With such a background it is readily understood that the roaring power and beauty of the waves as well as the lifestyle and image of the surfers have been picked up and used commercially by the marketing industry. Surfing is the mother sport of all board riding sports. And as such is has attracted many board maniacs such a skateboarders and snowboarders. The fascination for the sport of surfing has not even lacked attention in a landlocked country like Switzerland. It is cool and trendy to bridge the snow free summer of the mountains and to spend the vacation at the ocean with a surfboard instead. The Swiss surfing community consists of 45’000 active surfers. Over the last few years, surfing on standing river waves has become more and more popular. The first river surfing event had been organised with great success by the SSA in 1999. Although river waves are much smaller than their sisters in the ocean, standing waves in a river offer great possibilities to learn the sport of surfing and to improve manoeuvres, because these waves run smoothly and have a constant shape. The Swiss Surfing Association (SSA), founded in 1992, represents the sport of surfing in Switzerland on a national and international level. We are recognized by the International Surfing Association ISA, Surfing’s World Governing Authority and the European Surfing Federation as the national surfing association of Switzerland. The SSA represents and promotes the sport of surfing in Switzerland which consists of the disciplines Longboard, Shortboard, Bodyboard, Kneeboard and familiar water- and boardsports. Every year, the best surfers compete at the Swiss Surfing Championships held in Spain. This event is not only intended for competitive surfers but also brings together the Swiss surfing community. The Swiss Surfing Champions (male and female) and some of the best Swiss surfers form the Swiss Surfing Team which represents Switzerland at international surfing competitions such as the ISA World Surfing Games and the ISA World Junior Surfing Games. As the only landlocked country, Switzerland has participated and reached good results at international contest for over a decade. The SSA is probably the most exotic surfing association in the world. Counting over 3000 interested persons, 800 active members, estimated 40’000 – 45’000 regular surfers and a huge snowboarding community, the sport of surfing has a big potential in Switzerland. Continue to enable the participation of the Swiss National Surfing Team at the booming international competitions, at a worldwide level. To represent and promote the sport in Switzerland and become an information platform and a pool of expertise for surfers and surfing in Switzerland. 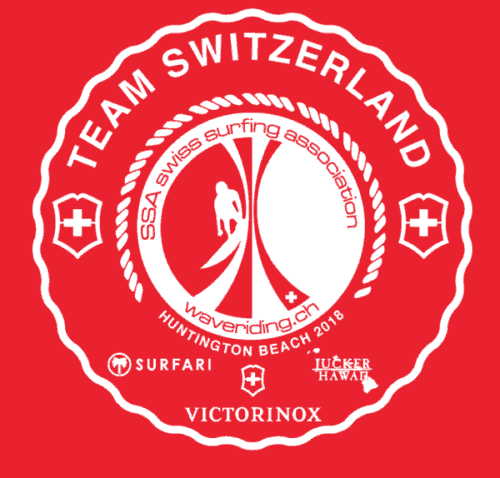 To gain presence in the media with our events and the achievement of the Swiss Surfing Team. Organisation and realisation of the annual national competition: the Swiss Surfing Championships. The participation in the Eurosurf, the biggest European surfing competition, held biannually by the ESF. The annual participation in the biggest surf competition on the planet: the ISA World Surfing Games. Organisation of the Swiss Surfing Championship and other surf related events like river surfing and wakesurfing. 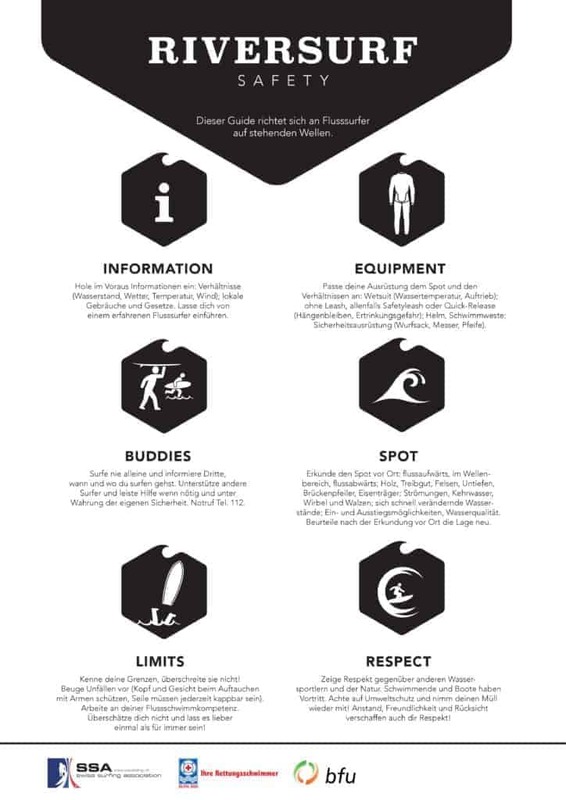 Cooperation with other stakeholders in the sport and representation of the interests of our members and other surfers.